Do you enjoy fresh herbs, fruits, and vegetables but have limited space in which to cultivate a successful, productive garden? If you rent versus own your home, are you looking for a way to maximize your growing capacity of herbs, fruits, and/or vegetables in non-invasive manner that you can take with you when you move out? If you answered yes to either of these questions, it’s possible that container gardening or vertical gardening may work well for you! Here at Hang-A-Pot, we are passionate about small space solutions that can provide beauty and efficiency to your space. Let’s take a look at a few tips for creating a successful vertical container garden. If you enjoy getting your hands dirty and want to get seeding and planting right away, this might not sound like very much fun. However, researching your climate and hardiness zone will save you time and energy. Likewise, you can be sure that you’re only purchasing plants that are most likely to thrive in your given location. The USDA has devised standard hardiness zones for each state based on location-specific climate conditions and minimum temperatures. For example, if you live in Colorado, your hardiness zone can range from 3a to 7a, whereas if you live in Florida, your zone ranges from 8a to 11a. Additionally, it may be helpful to research different kinds of potting soils because no two potting soils are the same. For example, some potting soils are designed to hold moisture for hot and dry climates, whereas some potting soils are designed to be quick draining. If you’re serious about a vertical garden that produces abundant amounts of herbs, fruits, and/or vegetables without the hassle of re-planting, doing a little research up front will save you heartache in the end. Once you’ve determined what plants will grow well in your area, we recommend starting small, possibly with one or two things at a time. Remember that the more plants you grow, the more there is to maintain and each plant is likely to have different maintenance needs. It may be easier to start with herbs because they tend to be low-maintenance and very inexpensive to replace if something goes wrong with your first time or two growing them. 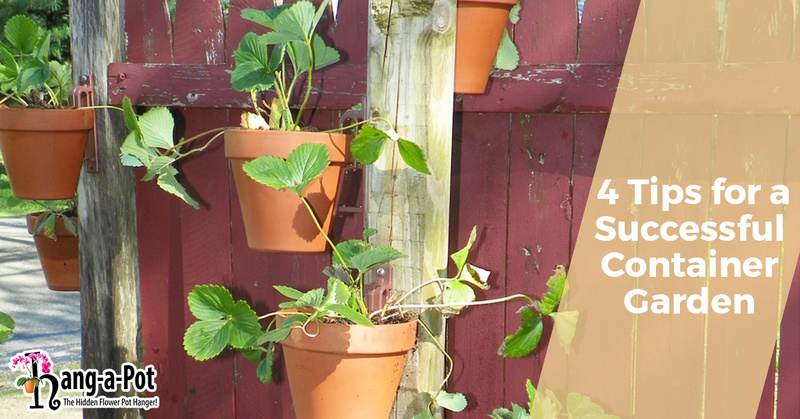 From the initial establishment of your container garden to ongoing maintenance, the inventors of Hang-A-Pot are here to help you along the way! Our hidden pot hanger supports any flower or herb pot, from four to 10 inches in diameter. Get yours today! Once your container garden starts to grow, it may be beneficial if your garden is constructed in such a manner to be portable. Some herbs and plants require more sunlight than others, and if your small space doesn’t get even sunlight throughout the day, having a portable vertical garden can be an easy solution. Here are a few ideas to get your plants moving! Hang your plant containers on a reclaimed pallet that can be picked up and moved to a different location if/when needed. Use an old, detached door to affix your containers to when they are small; just pick it up and move it elsewhere if necessary! Transform an old window frame into a beautiful garden for a lightweight, portable solution. Consider an old shutter as a base that you can attach your pots to for a mobile vertical garden. The wonderful thing about making your garden portable is that you can get as creative as you want. With Hang-A-Pot, you can attach pots to a variety of surfaces: wood, concrete, wrought iron, aluminum, vinyl, and much more! When planning for your vertical container garden, it is important to consider the various watering and drainage needs of your plants, if you have more than one type of plant. There are many benefits to vertical gardening, but one of the best is that you can make gravity work in your favor. Do you have some plants that require more dry soil than others? No problem! Simply place the plants that require less moisture at the top of your arrangement so that they can drain down into the lower plants that require more moisture. Hang-A-Pot also works off of gravity, leveraging the weight of your pot against the large angle of the hook. This takes the pressure off the screw Hang-A-Pot is mounted by, so you don’t ever have to worry about your pots falling. Hang-A-Pot is versatile to meet a variety of household decor and gardening needs, including that of your vertical garden. Let our invisible pot hanger do the heavy lifting for you. With Hang-A-Pot, you can enjoy a vertical or container garden in your small space – get yours today!